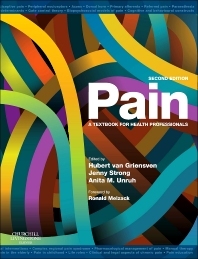 The highly anticipated new edition of Pain: a textbook for health professionals (previous subtitle a textbook for therapists) has undergone a major rewrite in order to reflect the rapid developments in the field of pain management. It highlights an effective and evidence-based method, providing the theoretical basis to help with the assessment and management of persistent pain, while also discussing in depth a range of specific approaches. Pain: a textbook for health professionals is written emphatically from a biopsychosocial perspective. In order to set the scene, the introductory section includes chapters on the patient’s voice and social determinants of pain. This ensures that the deeply personal and social aspects of pain are not lost among the more technical and biological commentary. These aspects provide an overall context, and are revisited in chapters on participation of life roles, work rehabilitation and psychology. The basic science section includes key chapters on the psychology, neuroanatomy and neurophysiology of pain. This provides a basis for subsequent chapters on specific approaches such as pharmacology, physical therapy and complementary medicine. Pain in specific patient groups, including children, the elderly and those with cancer, are dealt with in separate chapters, as are pain problems such as complex regional pain syndrome and chronic spinal pain. Although the emphasis of the book is on long term pain, acute pain is discussed as a possible precursor and determinant of chronicity. SECTION 1 – OVERVIEW: WHAT IS PAIN?